This is a brand new, OEM Lower Radiator Hose for your B6-B7 S4. This is the main hose on the driver's side of the car that connects to the bottom of the radiator and to the water pump. This is the LATE hose with the 25mm check valve connection. 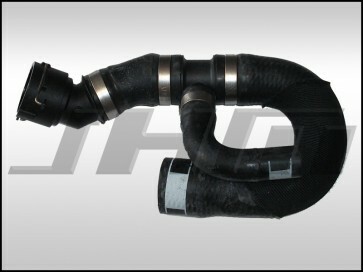 Most B6-S4s with VINs greater than or after 8E-5-023001 will have THIS HOSE. Most cars with a VIN less than or up to 8E-5-023000 will have a different version of this part (which we also sell). Audi does not list this split as being definitive so it's possible that you may have a hose different than the one identified by your VIN. The best thing to do is to look at the part number from the hose on your car. If you have a hose on your car with a part number of 8E0121055AD (or sometimes 8E0 121 055 AD) you have a LATE hose. Add this hose to your cart and proceed to checkout. If you have a hose on your car with a part number of 8E0121055L (or 8E0 121 055 L) you have an EARLY hose. Go back one section, select that hose, ad it to your cart, and proceed to checkout.